Shane van Gisbergen secured weekend honours for the Coates Hire V8 Supercars Challenge at Albert Park after fending off a determined Fabian Coulthard in Race 4. Van Gisbergen controlled the double-file rolling start from pole and led every one of the 12 laps to take his third race win of the weekend. While the previous two heats had been all Triple Eight affairs at the front, Coulthard and DJR Team Penske proved the wildcard in today’s battle. Coulthard swept around the outside of Jamie Whincup and Craig Lowndes into Turn 1 on the opening lap to settle into second. 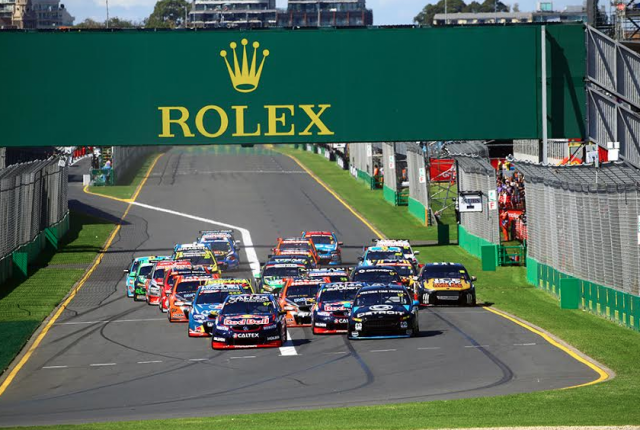 The Detroit backed Ford driver kept the pressure on his countryman for the bulk of the race before Van Gisbergen edged away in the closing stages. “Yesterday we tried something that didn’t really work, so we tried another thing today to keep up with the track,” said Van Gisbergen. “In the first few laps I thought we were in a bit of trouble. It took me a while to get the bars right but once the tyres came up I was able to drive away. Lowndes finished third after Whincup was forced to pull off the road at Turn 11 in the early laps with a mechanical issue. James Courtney came home fourth after a spirited battle with Michael Caruso. The pair rubbed panels at Turn 1 on the final lap in a move that saw the Holden Racing Team driver take the place. Garth Tander, Scott Pye, Rick Kelly, Chaz Mostert and Tim Slade completed the top 10. Tander and Mostert were shuffled back when they made contact at Turn 4 on the second lap after the HRT driver attempted a lunge on Whincup for fourth. Trying to make the most of Tander’s resulting loss of momentum, Mostert dived to the inside, resulting in side-to-side contact and a wild slide for the Ford. Along with Whincup, David Reynolds was the race’s other retirement, pitting after contact with Chris Pither at Turn 1 on the opening lap. “I held my line and he turned in hard from the outside,” said Reynolds.